Installation view, Geoffrey Farmer, Musée d’art contemporain de Montréal, 2008. Photo: Musée d’art contemporain de Montréal’. The Last Two Million Years. Foamcore plinths, perspex frames and cutouts from selected pages of the history book The Last Two Million Years. His works are like stage sets, and he has the reputation of being so meticulous that curators working with him are left breathless as he adjusts, moves and refines his installations. His 2012 installation Leaves of Grass assembled a monumental (124-foot-long) historical menagerie of clippings from vintage Life magazines, earning significant acclaim. 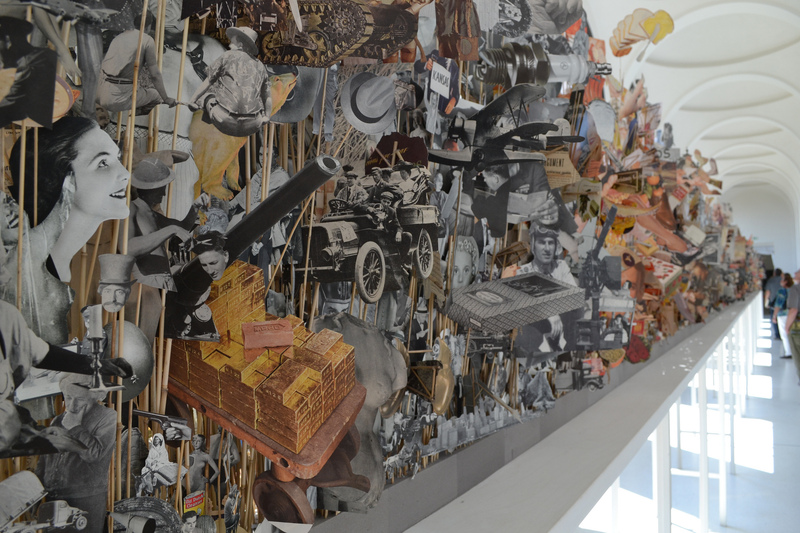 This image and the image at top of post: Installation view, Geoffrey Farmer, The Institute of Contemporary Art/Boston, 2016. Photo: Charles Mayer Photography. The Surgeon and the Photographer, ongoing since 2009. Paper, textile, wood, metal. Geoffrey Farmer at Catriona Jeffries, Vancouver here. To read about his planned installation for the Venice Biennale, in The Globe & Mail, here. National Gallery of Canada, here. Who is Geoffrey Farmer, The Tate Modern, Britain, here. Leaves Of grass looks stupendous. It would captivate me for hours in real life. I wish I’d seen this one. Agreed.